Windows Vista and 7, unlike Windows XP, do not come enabled with a post-mortem debugger out of the box . But you can enable crash dump archiving by editing the Windows registry. Create a new key called LocalDumps in HKLM\Software\Microsoft\Windows\Windows Error Reporting (by default it points to %LOCALAPPDATA%\CrashDumps). A DWORD value called DumpCount with a value of decimal 10 will set the max number of dumps to save into this file at 10. 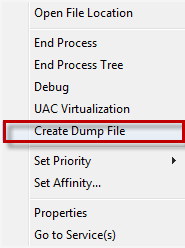 A new DWORD value called DumpType with value of 1 or 2 decides the type of dump (1 = minidump, 2 = fulldump). The crash dump will be created in \Users\UserName\AppData\Local. To change the destination, modify DumpFolder to the desired path. Alternatively, if the app errors and the process remains running until the error message box is dismissed, you can use the Windows Task Manager to manually dump the process by right-clicking it and choosing Create Dump File. See this MSDN article here for more details. This entry was posted on August 11, 2010 at 3:20 pm	and is filed under Inside Windows. Tagged: Crash, Dump. You can follow any responses to this entry through the RSS 2.0 feed. You can leave a response, or trackback from your own site.